Manager of Wellington Botanic Gardens. 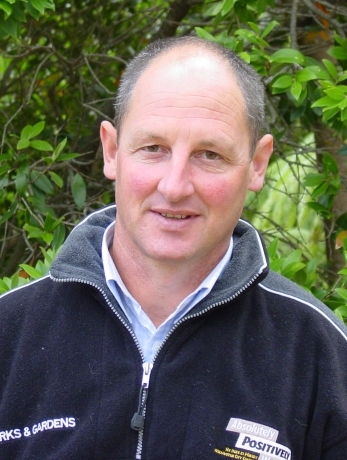 David Sole first became a member of the RNZIH in 1979 as part of his NDH studies. During that time he worked for Wellington City Council Parks & Reserves, which was at that time under the administration of Ian Galloway and Richard Nanson. He completed his NDH (Hons) in 1985 and was awarded the David Tannock Prize for his Oral & Practical examination. In 1986 he left employment with the City and, along with his wife, established the business Sole Gardening & Landscaping Ltd. It offered landscape maintenance, arboricultural and landscape services through until 1995 when he decided to focus on the landscaping side of the business. While the RNZIH administered training he acted as an examiner for a number of Oral & Practical Examinations and later, as trade training moved across to unit standards, was part of the team from the Landscape Industries Association of New Zealand (LIANZ), involved with the consulting on the unit standards and went on to become a HITO board member, representing LIANZ and the landscape industry until 1995. As a member of The New Zealand Landscape Guild, later to become LIANZ, he served on the executive, and also as vice president and involved with the New Zealand Landscape Awards Programme. He has been an active local member of LIANZ until recently. In October 2003 David was appointed in the position of Manager of Wellington's Botanic Gardens where he enjoys working in a stimulating and forward thinking environment with skilled staff and local, national and international associations. He has maintained his membership of the RNZIH, was made a fellow in 1996, and was Chairman and then President from 2006 to 2013.